This is probably one of the most powerful Pyramids that I have created over the last ten years and it’s down to many things, a Mini Tesla Coil, Specific crystal combinations, testing different combinations of metals and crystals. The reason this has an enhanced energy is the combination of Aluminium Particles, Copper Powder, Monatomic Gold (Orme), a magnetic copper coil wrapped quartz crystal along with five other gemstones such as Kyanite, Selenite, Herkimer Diamonds, Lemurian and magnetite. 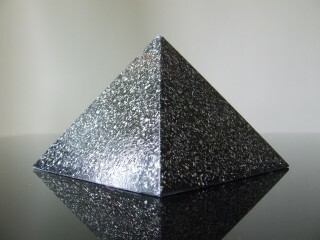 i bought the 2000g pyramid and its perfect like any other photon orgone item so i highly suggest to buy one to anyone.the smallest pyramids work nice so needless to say a bigger one work even better at least for the range.